Re-Fence or Defense? Or Snatching Victory from Defeat? 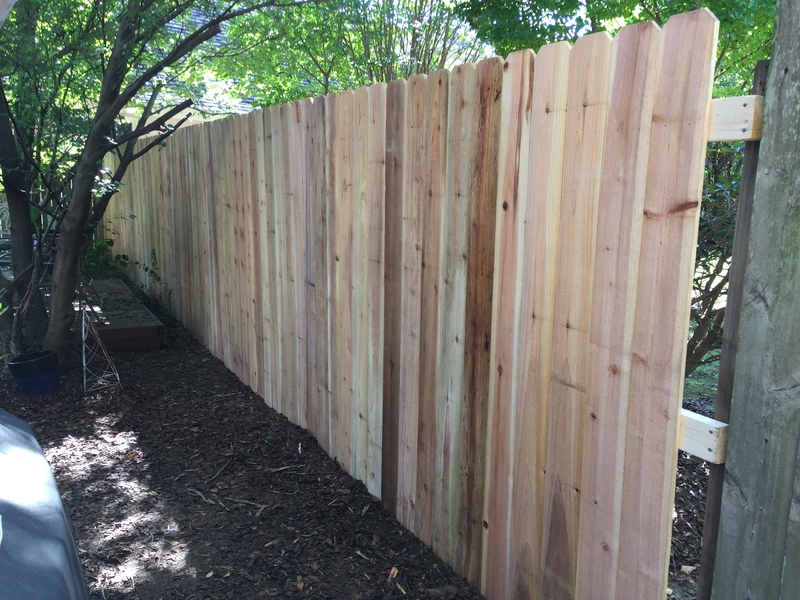 It took me until almost lunchtime the next day to finish the first section but by contrast, it was a vast improvement over the old fence. And in the process I had learned several things. 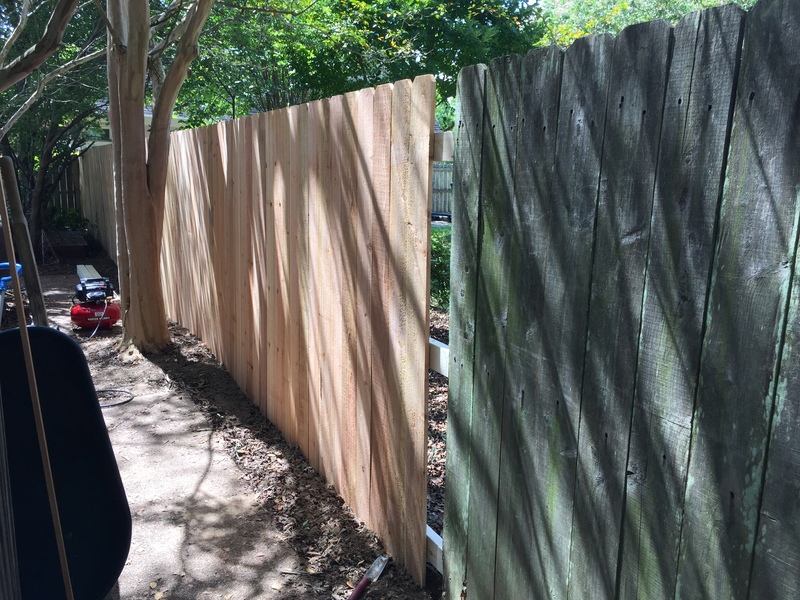 First, these dog-eared fence boards are not precision cut. Sometimes when I would insert my little tile spacer at the top, I would look down and see a huge gap or none at all at the bottom. 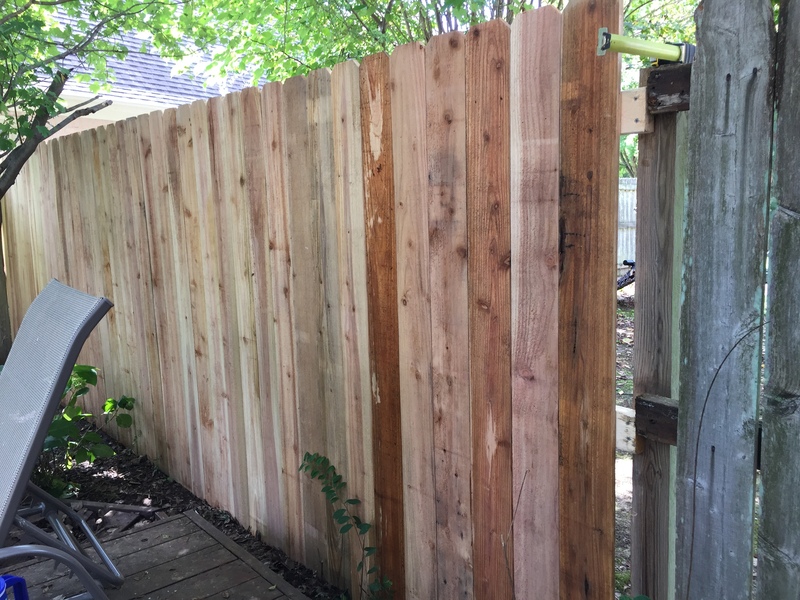 It was almost like putting a puzzle together finding a fence board that mated well with the previous board. If I found a board, which had big gaps at the top or bottom, I would set it aside and hope it might fit well later next to a different board. Second, because of the above, the whole argument about gaps was probably academic. With the variations in boards, I was easily going to end up with a variety of gaps or none at all. 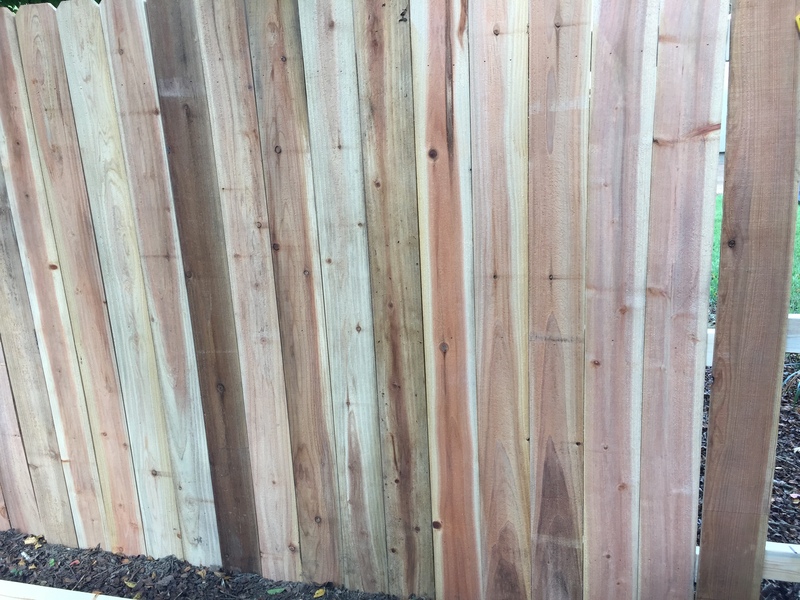 My fence could probably support both sides of the discussion. 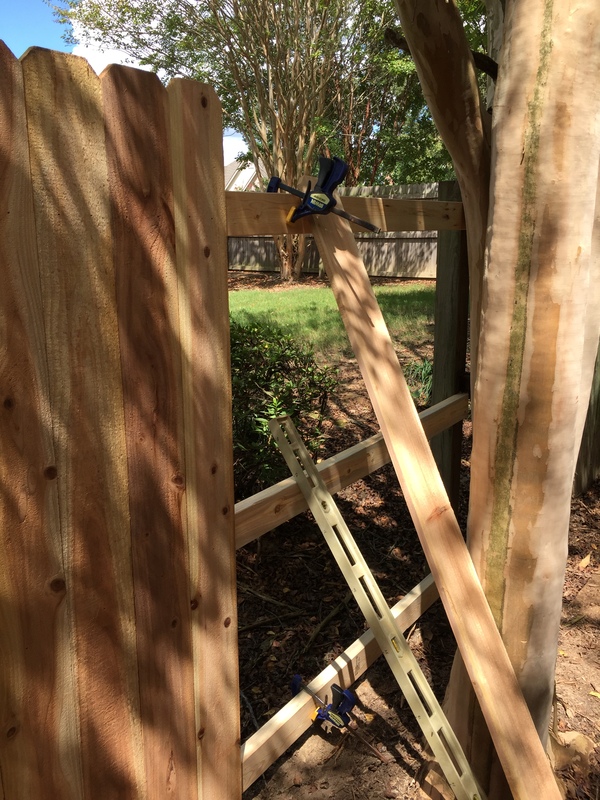 Third, while the nail gun made the attaching process very fast (much faster than nailing with a hammer), lining everything up and making sure it was plumb and level took a good bit of time. 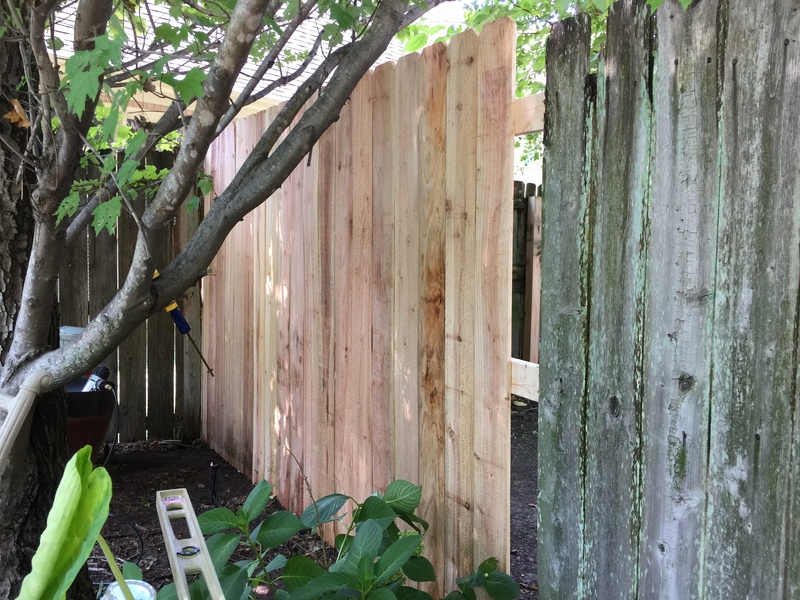 It ended up taking me from start to finish, about four to five hours to complete a fence section (teardown through replacement). But I would learn more things as I went along in addition to having more frustrations. 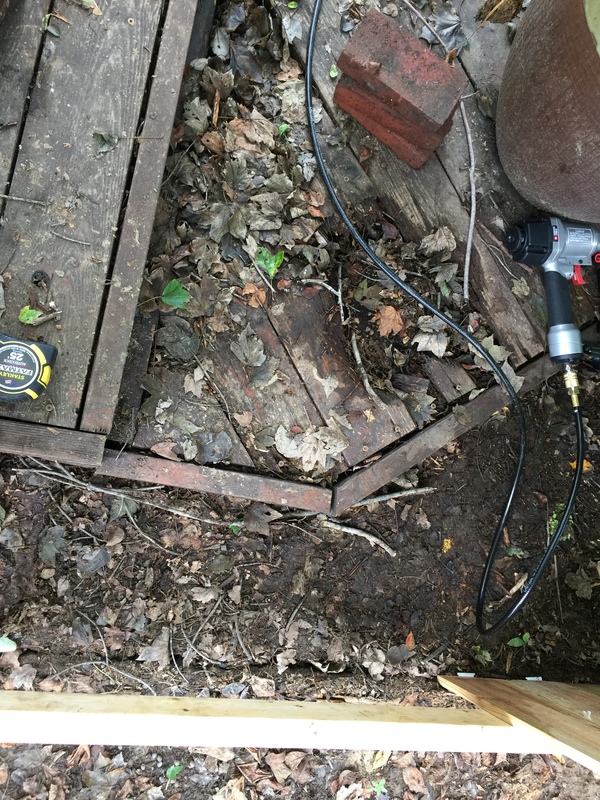 Like having finally gotten past the sprinkler head I kept tripping over, I don’t know how many times I stepped into this rotted portion of the deck (obviously another project on my list). With more rain in the forecast for the afternoon (which I couldn’t believe considering how dry it had been), I decided not to get started on another section and get rained out again (which as it turns out, I would have as it rained hard again that afternoon). So after two days of work, I had one section to show for it. So on the third day, I wanted to make more progress and so planned to complete two sections that day. By 2:30 in the afternoon, I managed to get the second section complete. Then on the next section I encountered a bit of a problem: a fence post that had gotten warped over time resulting in a significant lean towards our house. If I were fencing in the Leaning Tower of Pisa, this section would fit right in. 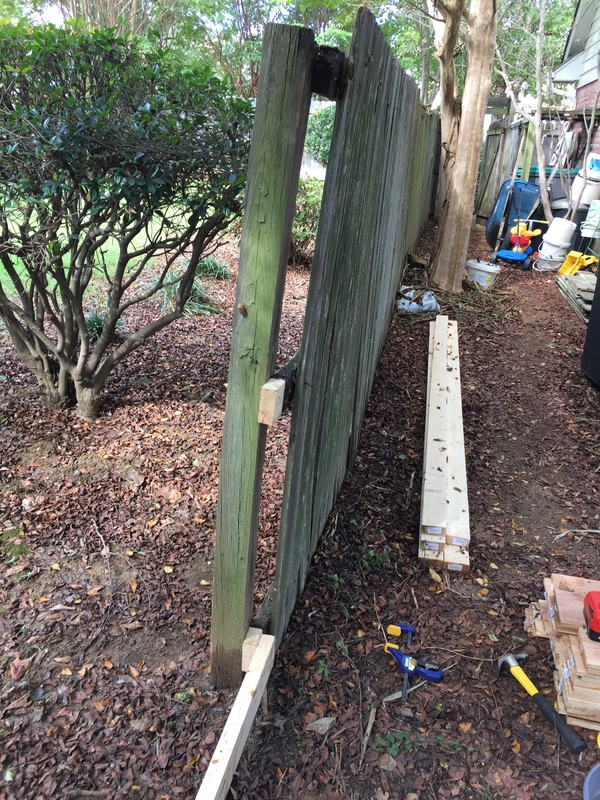 Quickly realizing that replacing the post would add an extra two days to the job, I improvised and tacked on small sections of 2 X 4 at the bottom and middle of the warped post to which I would attach the cross beams. 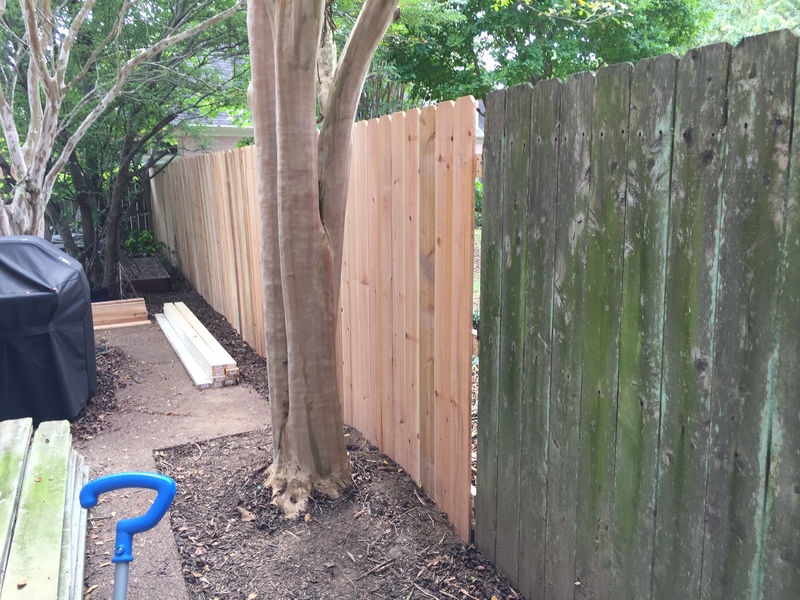 While it wouldn’t necessarily be aesthetically pleasing to my neighbor, it gave me a much less bowed fence section (although not completely plumb). With this unexpected challenge tackled, I jumped on the next section only to get rained on again! The third day in a row! Fortunately, that afternoon’s shower was not accompanied by thunder and lightening and only lasted about 30 minutes. So by early evening, I managed to complete this second section for the day and third section overall; just five more sections to go. 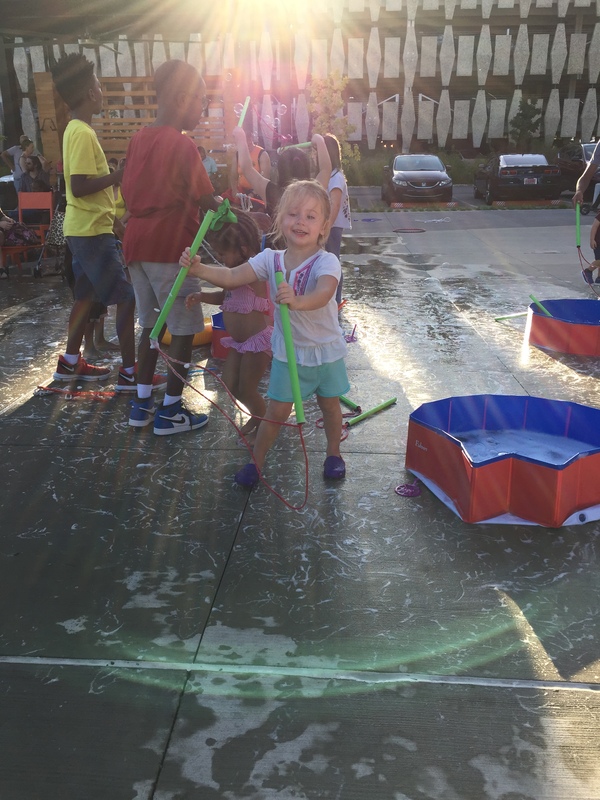 …ready for a little fun with my granddaughter at a local festival on Saturday night. 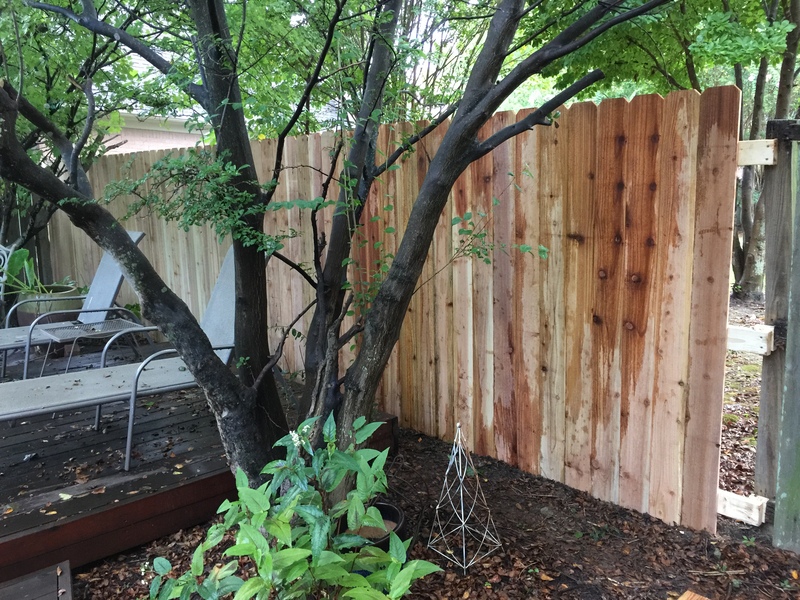 Having finished half the fence in four days, I was optimistic that I could get finished before I went out of town again on another weeklong trip. So on Labor Day, I tackled the fifth section but encountered more problems. First, I found more boards that were too bowed to use that had to be set aside hopefully for use later. Second, I had trouble working around this almost 20-year-old crepe myrtle. 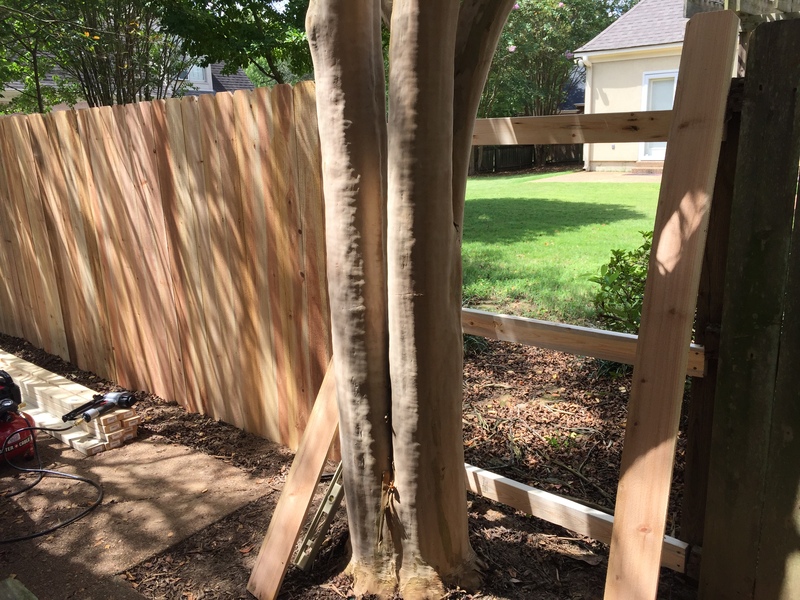 The tree trunk had grown so large I had a very hard time using the nail gun to attach the fence boards. So several of the boards went in with the nails at an angle, a variation that hopefully won’t be too noticeable. By mid afternoon, I had the fifth section complete and no rain! On Tuesday, when I took down the next old fence section, I found that the post had split leaving a small round post in the middle and with the square sides bowed out in all four directions like petals of a flower. My first thought was whoever installed this fence must have used just the cheapest materials they could find considering how bad a shape it was in. This also explained why the fence was falling down at this section as the cross beams had bowed back with the sections of the post that had separated from the round middle section. Coming up with a field improvisation, I clamped the post back together and screwed 3-inch screws into all four sides. It seemed to hold and so finished up the section. With six of the eight sections now completed, it was very satisfying to stand by the fence and gaze along the new and straight fence. Only two sections to go! Previous Previous post: Re-Fence or Defense? Or Defeat? Next Next post: Re-Fence or Defense? Yes, Victory! onecreativescientist Re-Fence or Defense? Or Snatching Victory from Defeat?